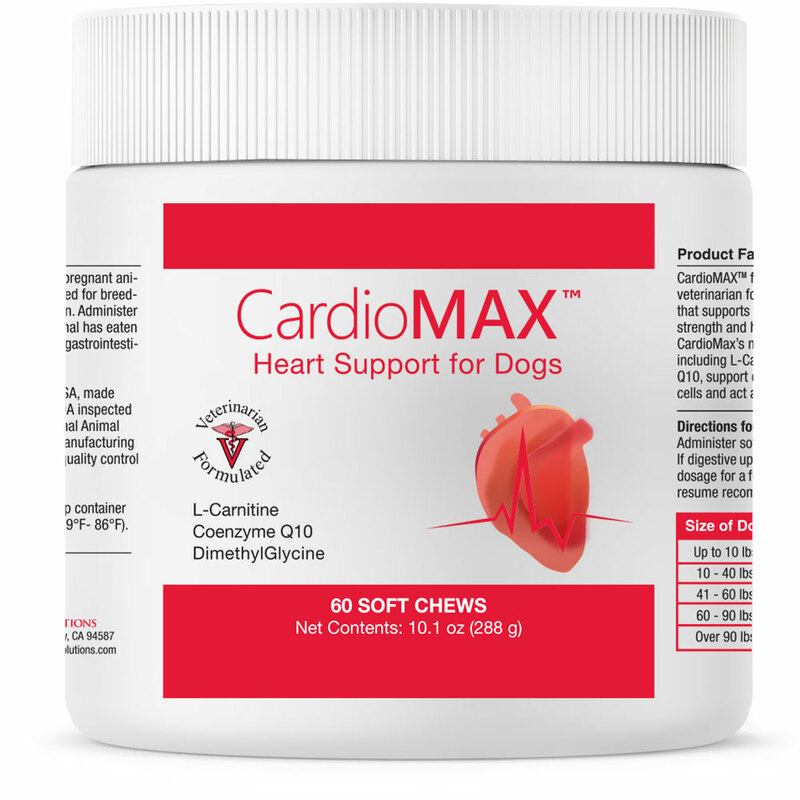 CardioMax™ for dogs is a veterinarian formulated supplement that supports your dog's circulatory strength and heart muscle function. CardioMax's™ main ingredients, including L-Carnitine and Coenzyme Q10, support energy production in cells and act as antioxidants. Administer soft chew directly to dog. If digestive upset occurs, taper dosage for a few days then gradually resume recommended dosage.. Cautions: Safe use in pregnant animals or animals intended for breeding has not been proven. 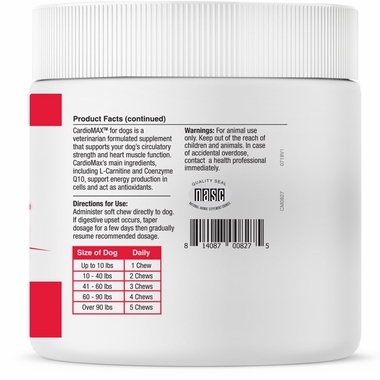 Administer during or after the animal has eaten to reduce incidence or gastrointestinal upset. 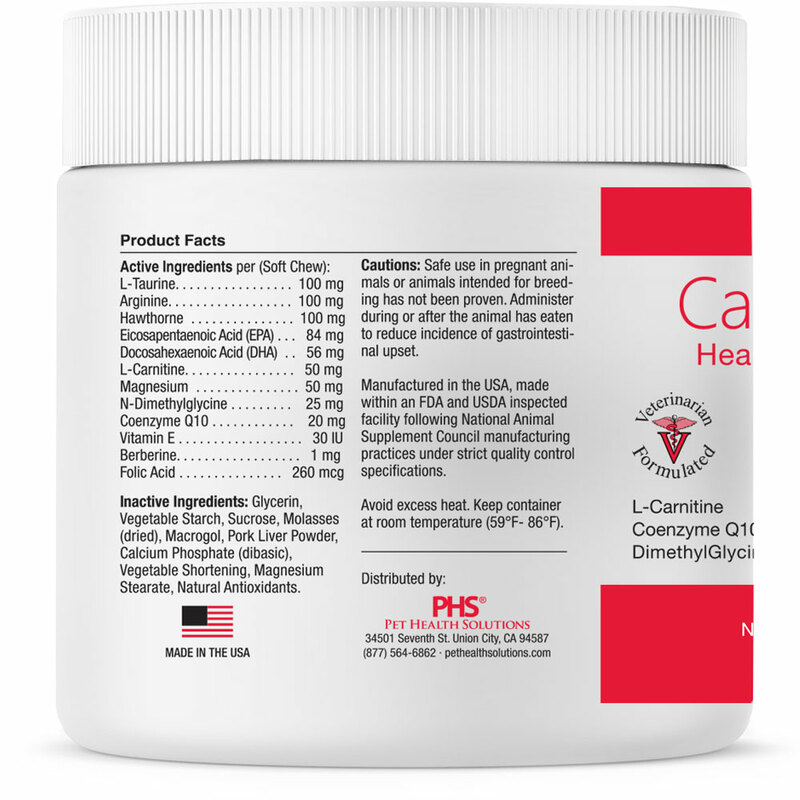 Manufactured in the USA, made within an FDA and USDA inspected facility following National Animal Supplement Council manufacturing practices under strict quality control specifications. Cavalier King Charles Spaniels, Dachshunds, Miniature and Toy Poodles, Doberman Pinschers, Boxers, Golden Retrievers, Miniature Schnauzers, Great Dane, German Shepherds, Irish Wolfhounds, Scottish Deerhounds, Labrador Retrievers, Newfoundlands, St. Bernards, Bullmastiffs, Bernese Mountain Dogs, Rottweilers, Malteses, Pomeranians, and Samoyeds. *All dogs can develop heart disease. Talk to your vet about how best to protect your pet.